A few years back, I realized that I was woefully ignorant about manga. Not only what might be considered 'canon' works but how the whole industry operates. When I discovered Bakuman around that time, I was pleasantly surprised to see that some manga were somewhat self-referential, shedding light on the manga production process while telling an entertaining story. Since then, I've tried to keep my eye out for manga in this vein, and that's how I came across A Drifting Life by Yoshihiro Tatsumi. The book is a memoir, covering Tatsumi's entry into manga and his early days as a mangaka and, at times, editor up until around 1960. (With a brief epilogue in the mid-'90s.) As the title suggests, the story doesn't always follow a straight and logical path. It shows us Tatsumi and some of his contemporaries working to become professional mangaka, but it also includes portions of their formal schooling, failed romances, drunken nights out, and other almost non-sequiturs relative to the main story. There are also additional social signposts throughout the book, citing when notable events in Japan took place to provide a broader cultural context. The details about how publishers operated were the most fascinating to me. As I said, I came to the book primarily with an interest in exactly that. Those cultural signposts helped a great deal as well, for example, in explaining why editors frequently communicated with artists via telegram. I would have preferred some of the blind alleys (i.e. the failed romances) to have been eliminated in favor of additional discussions of manga. Back in the day, there was evidently a healthy debate on the differences/similarities among manga as it was traditionally known and gekiga and komanga. But those discussions are largely only alluded to, and there's little description of what gekiga even is. For as daunting-looking as the book is, clocking in at over 850 pages, it's a surprisingly fast read. Tatsumi's style is fairly light and cartoony, likely contributing to that relatively quick reading. He also doesn't delve into any particularly complex issues or concerns. Towards the end, he gets briefly wrapped up in a protest against The Treaty of Mutual Cooperation and Security between the United States and Japan, but he sums up the opposition's stance with an almost off-hand remark and even flatly says he mostly just got swept up in the emotion of the rally without a substantive understanding of the treaty itself. Despite going quickly, it still required multiple sessions for me to read through it all. Which I only mention because the repeated opening and closing of the book led to glue on the spine beginning to fail as I got to the last 100 or so pages. It's such a thick book that the binding used for a typical paperback seems a bit inadequate. It's possible I just happened to get a bad copy, but I have the feeling my copy isn't the only one that started falling apart before even a single reading. 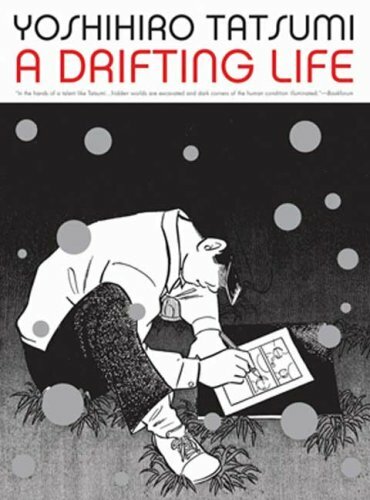 A Drifting Life is a fascinating and detailed description of the birth of the manga industry, and the lives of some of the original stars, most obviously Tatsumi himself. There's surprisingly little emotional depth here, but the factual and contextual aspects of the book, which are the parts I was more interested in anyway, more than made up for it.